From owner Javier Granda, who also operates Pancho's Mexican Restaurant in El Cajon, Lima Peruvian restaurant will be a full service bar and grill devoted to South American cuisine. The menu is currently being developed by consulting chef Melvin Iriarte la Rosa, who has over twenty years experience as a chef in Lima and is currently executive chef at Rasson Brasas Gourmet in the Miraflores neighborhood of the Peruvian city. Day to day kitchen management will be in the hands of Chef José Miguel Ferrer López, a graduate of Tijuana's Culinary Arts School who has worked at the popular Navio Seafood & Drinks in Tijuana. Lima Peruvian Food & Cocktail will present authentic and regionally-influenced Peruvian cuisine served in a casual environment. The lunch and dinner menu will offer a variety of authentic Peruvian dishes such as lomo saltado (tenderloin with French fries and vegetables), arroz con mariscos (rice with saffron and seafood) and traditional Peruvian cebiche - made from corvina fish marinated in citrus and tangy aji amarillo chilies. Vegetarian and gluten free options will be available, as well as Peruvian-inspired desserts and a children’s menu. All dishes will be made from fresh, local ingredients. The restaurant will also feature a full bar that offers Peruvian and craft cocktails, beer and South American wines. 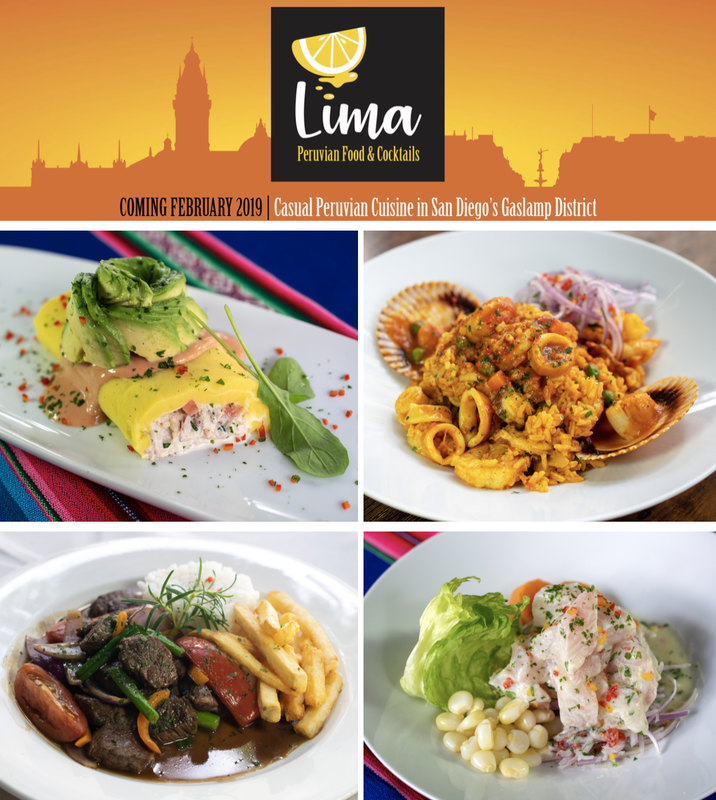 Lima Peruvian Food & Cocktails is expected to debut in February 2019 at 409 F Street in downtown San Diego.